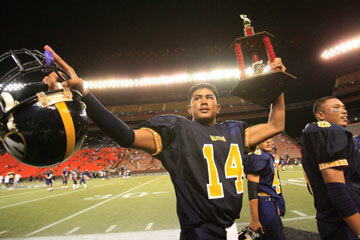 Waipahu's Gil Fernandez raised the OIA White trophy after yesterday's OIA White Championship game at Aloha Stadium. Risen from the depths of last season's struggle, the Waipahu Marauders made their transformation complete. Playing turnover-free football, along with air-tight defense, Waipahu stifled Kaimuki 22-6 last night at Aloha Stadium to capture the Oahu Interscholastic Association White Conference championship. "This means a lot. Coach taught us about being a family, about digging down deep," senior lineman/place-kicker Aaron Paahana said, tears streaming down his face moments after the game. Waipahu (7-2-2) will travel to the Big Island and play Kamehameha-Hawaii on Friday night. This is the school's first White crown. "Kaimuki's got such an athletic bunch of guys. We're like the guys from 'Lord of the Rings' with hobbits and all," Waipahu coach Sean Saturnio said. "We knew a lot of Kaimuki's starters go two ways, so we had to be physical. They have a lot of pride and represented their community well. My hat's off to Coach (Daniel) Mafua and his team." Kaimuki (6-4-1) will face the ILH champion Friday at Radford's Jimmy Velasco Stadium. Damien and Iolani meet tonight for the ILH D-II crown. "They've grown a lot since our last game," Mafua said, referring to Waipahu's 19-14 win over the Bulldogs in regular-season play. "I thought we were more prepared, and we could've played better, but give Waipahu credit." The Marauders' gang-tackling defense limited Kaimuki to 105 total yards. Waipahu's tough-nosed, blue-collar victory capped a resounding turnaround from last year's struggles. Turnout was small, a homecoming game was forfeited due to a lack of eligible players and Saturnio endured hostile, anonymous phone messages regarding his steadfast discipline. He stood his ground, however, and his players stood by their coach. Saturnio choked up when he heard what Paahana had said. "It's usually hard for me to be speechless," he said. "We're trying to raise up a community and lift up a town. We're trying to be the men we were put here to become." In typical Marauder style, seven different players carried the ball as Waipahu amassed 196 rushing yards on 41 attempts. With Gil Fernandez directing the option attack fluidly, Waipahu did not turn the ball over against a physical, quick Kaimuki defense. "Kaimuki played a helluva game considering how much numbers they've got," said Paahana, who got the scoring started with a 27-yard field goal in the first quarter. Kaimuki's patience on offense paid off in the second quarter with a 10-play, 71-yard drive. Maua Tuitele's 1-yard burst into the end zone gave the Bulldogs a 6-3 lead with 7:31 remaining in the first half. "Fifty-five was kicking our rear ends all over the field," Saturnio said of Kaimuki linebacker Keone Reyes. "He's a stud, an unbelievable player." Undeterred, Waipahu made adjustments at halftime. "They did some things a little bit different," Saturnio said. His coaches made some tweaks in their offensive scheme that gave the Marauders an edge in the second half. "We'd rather have their safeties making tackles instead of their linebackers. They have a lot of fast linebacker types," he added.